Cantegrel, two lovely houses set in 4 acres of land at the edge of a wood, carefully restored and furnished with French antiques. The position is absolutely unique on a cliff top overlooking the river Dordogne. You will enjoy complete privacy in that romantic location. The two houses are rented together as an ensemble and they are ideal for 6 people. A sunny terrace and a large yard will allow you eating outside and sunbathing. Beauty and peace, those are the two words which describe Cantegrel best ! Sport: Straight from Cantegrel enjoy long walks in the countryside. You can also ride horses ; canoe on the river Dordogne, Vézère or Céou ; climb cliffs ; swim in the Dordogne ; fly over castles by plane, balloon, ULM ; play golf : 'le Domaine de Rochebois', 9 holes (Vitrac 15 km) and 'le Golf de l'Olivarie', 18 holes (Siorac 14 km). If you wish to canoë on the river Dordogne, you'll find two renters on Enveaux beach, 1 Km from Bézenac. An 'air park' on the same beach will delight kids and teen agers with tree-climbing, ropes, nets, passages on top of the trees overhanging on the river, etc.. Historic area: During the One Hundred Years war, the Dordogne was on the frontier between the English and French kingdoms. Several towns like Monpazier were built by England on a very special plan, the 'bastides'. When God set the castles in France, he put the most beautiful alongside the river Loire and then tired of his job he emptied all the rest of his bag on the Périgord. That means you will never have enough time to see them all ! The two local castles Beynac (4 km) and Castelnau are truly splendid. Michael Crichton's novel 'Timeline' takes place in the village of Bezenac, but in a more dangerous time than nowadays. Les Eyzies de Tayac (15 km) is known as the capital of prehistory. 'The shelters of stone' last book of Jean M.Auel is located around Les Eyzies. Several famous painted caves are very near (Lascaux (40 km), Rouffignac, Font de Gaume). Gastronomy and festivals: 'Good food and wine, this is paradise on earth' said France's much loved king Henry IV. In Périgord eating well is a way of life, a source of pleasure and friendship. The country markets (Saint Cyprien 4km, Sarlat 15km), will provide all the quality products to make yourself the famous "cuisine périgourdine". You will also find all around the different types of restaurants, from the cheap but excellent "repas à la ferme" to the three stars table. During the summer, there are many festivals, for example the theatre festival of Sarlat in July and August. Cantegrel was purchased in 1956 by my parents and I follow keeping it in good condition to welcome our guests. There is an extra cost for linen (sheets and towels) of 15 euros per person. You can, of course, bring your own. Dining area with open-plan kitchen fully equipped. For your entertainment there is a collection of DVD with a lot of them in English. 3 Bedrooms, two with a large bed, attic bedroom with large bed, two single beds. Big yard and terrace. A large wooden table with two benches allows eating outside under a large umbrella. A cold outside shower to refresh in the summer. Pets are welcome in the large garden. Helene's beautiful place to others for a stay in the region - it is perfectly located for visits to all the major sites. 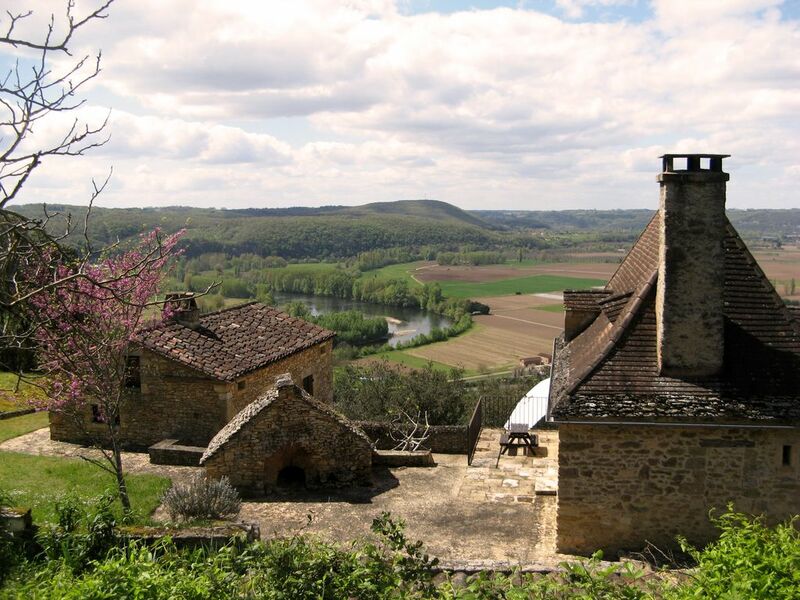 We visited the Dordogne in November with a view to buying a property of our own. We were attracted to Cantegral by the huge selection of pictures available on-line, giving a really good idea of what the property had to offer. The two properties are set high up in the hills with a great view of the Dordogne and valley around St Cyprien. As we were very fortunate with the weather, we were able to sit out on the terrace and enjoy the views and sunsets over the valley on several afternoons. I can only imagine how much better it will be in the summer season, enjoying a glass of wine over dinner with those great views. Despite arriving quite late one evening, we received a warm welcome from the owners who had set a roaring fire in the hearth and ensured the heating was up and running. The main house offers a living area with good facilities, a huge master bedroom and plenty of accommodation for another 4 people on the next level. There is also a separate house just a few steps away for added privacy or extra guests. Everything was very clean, tidy and in good order, which meant we could simply get on and enjoy the stay. For me, this was a wonderful base from which to tour around the Perigord Noir region –close to many places of interest but away from the main tourist areas. It also had the added attraction of some wonderful books written by the owner, including an excellent book on the history of the area, which I just had to buy! I’d strongly recommend it as a great place to stay, with very friendly, helpful owners and an amazing location. Our visit? Typified by peace and sunshine + good food and wine at the farmhouse ( yes, we cooked and BBQ'd most days at home and the facilities are excellent) + the beauty ( and cuisine) of the surrounding area and the lovely local town - great market. The view from the cottages over the Dordogne are worth the rent on their own. If you like nightlife, other than restaurants, this is not for you. If you like looking at stars, talking and drinking good French wine, it is. And walking locally? Really good and straight from the farmhouse - take a proper map so you know where you are going and you will find a cold beer at the end of your walk if you plan where you are going. If you end up in the local town and have a few then the taxi home is around 12 euro. And for the English out there, don't believe anything you hear about French people - everyone was friendly and accomodating. We have been twice, and we will go again! My husband & I stayed at Cantegrel for 6 months and throughly enjoyed it. The house certainly had every amenitie for that length of stay and Helene, the owner made sure that the property was clean and tidy for when we arrived and also throughout our stay. The views from the the bedroom window of the Dordorgne river were spectacular and the grounds of the two houses were fantastic for our dog and two cats as we had taken these with us. Our dog had never had so much freedom before and in fact was very reluctant to leave. The surrounding area, villages and local town, Sarlat were picture postcard material and the food market on a Saturday morning in Sarlat is a definate must. Sounds too good to be true, doesn't it? But if I could go back tomorrow I most certainly would and I think our dog would be hot on my heals! Whether you require peace and quiet or more of an active holiday, walking, canoing, historic castles, sightseeing galore or just sampling the famous French cusine than this is the place for you! However I would recomend a car as most amenties eg restaurants, bars, castles etc are a short drive away. Be sure all the neighbourhood remembers you and the long walks you were making with your funny english dog. May be, when you need a break from torrid Spain, you will come back to the green perigord and I will be delighted to welcome you again at Cantegrel ! Propriété magnifiquement située en pleine nature avec une vue merveilleuse sur la vallée de la Dordogne. Les bâtiments offrent tout le confort souhaitable tout en gardant le charme et l'authenticité d'une ancienne ferme périgourdine.Nous reviendrons ! Cantegrel is in Aquitaine, the south-west part of France. The highest house of Bézenac village, it overlooks one of the most beautiful part of the Dordogne valley. 15 km from the medieval town of Sarlat, it is in the very heart of Perigord Noir, the 'pays du bien-vivre'. Henry Miller described the area as the nearest thing to Paradise on earth. The let is from 5 pm on the day of arrival until 10 am on the day of departure. The reservation is effective at reception of deposit of 30 % for each week. Balance to be paid 8 weeks before start of your holidays. Linen and towels are not included in the price of the rent. You can bring them or we can put them for 15 Euro per person.